Healthcare reforms now pending in Congress could have unintended consequences for business cycle policy. Government spending on healthcare, especially Medicaid, is an important automatic fiscal stabilizer. Such automatic stabilizers help explain faster US recovery from the Great Recession compared with the EU. All economic policies have unintended consequences, sometimes surprising ones. The effects of proposed healthcare decentralization on business cycle policy are a case in point. When we think of business cycle policy, what usually comes to mind are active countercyclical measures like tax cuts and spending increases to stimulate the economy during a recession, or tax increases and spending cuts to hold the lid on during a boom. Examples include the Bush administration's tax rebates in the spring of 2008 and the much larger stimulus package under the Obama administration in early 2009. However, the economy’s built-in automatic stabilizers, which work to smooth business cycles even when no active measures are taken, are even more important. Automatic stabilizers are decreases in personal and business taxes that occur when incomes fall during a recession and increases in spending on social benefits that occur when unemployment rises. Unemployment benefits are the best known of the automatic stabilizers, but in recent years, Medicaid has become increasingly important. For example, early in the global financial crisis, a study from the Kaiser Family Foundation estimated that an increase in the unemployment rate from its 2007 level of 4.6 percent to 10 percent would add more than 5 million people to the roles of Medicare and related children’s health programs. The Better Care Reconciliation Act now moving through Congress would sharply shift fiscal responsibility for Medicaid and other health programs from the federal to the state level. Doing so would undermine Medicaid’s effectiveness as an automatic stabilizer since state finances are subject to balanced budget rules. Except to the extent they are cushioned by rainy day funds, state expenditures on non-capital items are constrained by tax receipts. During a recession, when tax revenues fall, expenditures must be cut, too - fewer teachers in the schools, fewer rangers in the parks, and fewer home health assistants for the elderly and disabled. Such cuts are procyclical - they add momentum to an economic downturn rather than moderating it. The problem of procyclical state spending is made worse by the fact that recessions always hit some states harder than others. 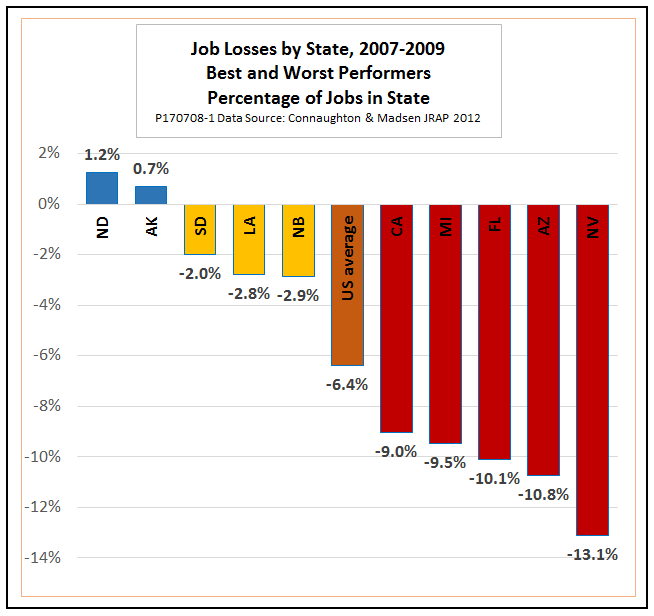 For example, the data in the following chart show that during the downturn of 2007 to 2009, job losses in Nevada were more than twice the U.S. average, with Arizona and Florida close behind. In contrast, Alaska and North Dakota actually gained jobs. 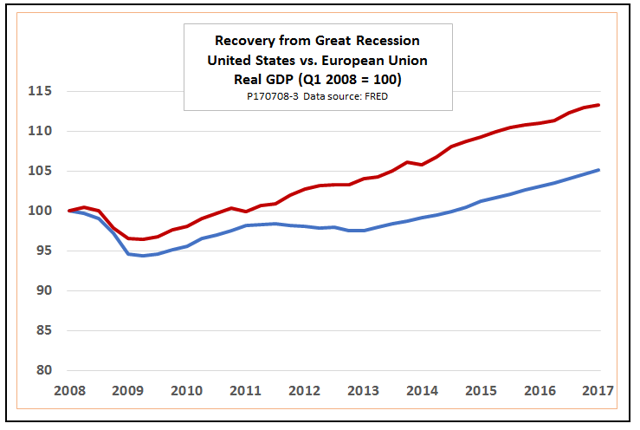 We can see how much regional differences and automatic stabilizers really matter for business cycle policy by looking at differences between the United States with the European Union. The EU central budget provides almost nothing by way of automatic stabilizers. It accounts for only 2 percent of all government spending, with member states and local governments responsible for the other 98 percent. The comparable ratio in the United States is about 70/30. Yet, despite bearing almost all the burden of public expenditures, individual member states of the European Union are subject to balanced budget constraints only slightly less stringent than those of the 50 U.S. states. As a result, in the aftermath of the global financial crisis, EU member states were forced to undertake severely procyclical austerity measures. 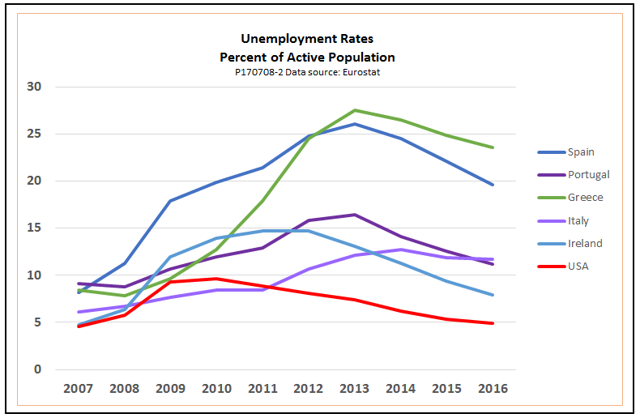 As the next chart shows, these pushed unemployment rates up and kept them high for years. In the more fiscally centralized United States, the unemployment rate reached its peak and began to decline much earlier (For a detailed case study on how this all worked out in Greece, see this slideshow). The greater strength of automatic stabilizers in the United States, together with greater willingness and ability to pursue discretionary countercyclical policy, was a major factor that allowed the US economy to recover much faster than the EU from the Great Recession. This is not to say that GOP healthcare reforms will, by themselves, turn Florida into Spain or turn the United States into the European Union. However, they are a step in the wrong direction. Ignoring the unintended consequences of healthcare decentralization will not make them go away.